PA File Sight will help you determine who is reading from and writing to important files. It can tell you when a new file or folder is created or renamed. And, when a file or folder gets deleted, PA File Sight can tell you who did it. Plus, you can often find out what program was used to perform the action. design, and an advanced automated reporting system with adjustable parameters. The PA File Sight driver uses significantly less memory than its competitors or earlier versions to further reduce its monitoring load. PA File Sight 4.1 is enterprise ready. 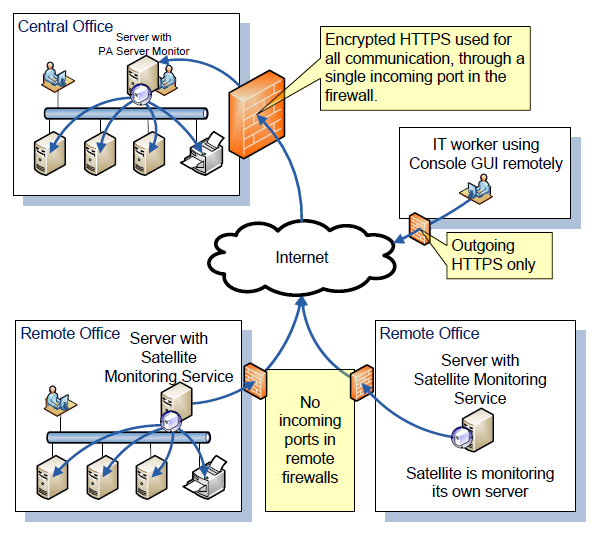 Easily push out monitoring Satellites to watch remote servers and report back to a central system. Administer the system from anywhere. 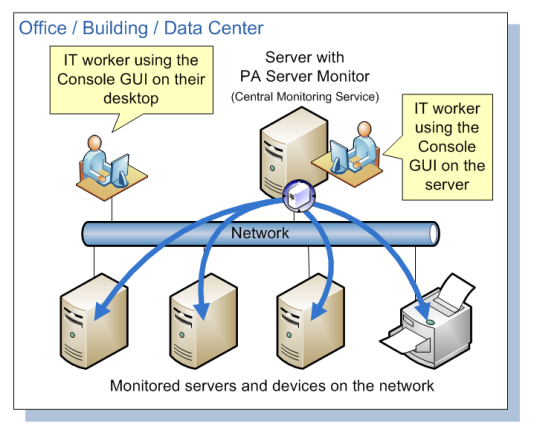 Monitor your servers and devices on the network from a single installation of PA Server Monitor. The Satellite Monitoring Service comes bundled with the Ultra Edition -- no extra add-ons or fees for monitoring servers at remote locations. PA WatchDISK scans directory structures and stores the sizes of each directory. These stored sizes provide a historical snapshot of your server's disk space usage on a directory by directory basis. Comparing current sizes to previous sizes allows you to very quickly see which directories have grown and project future disk capacity needs. PA WatchDISK's intelligent sorting, simple drill-down user interface, and reports make it easy to quickly find the information you need. Naturally low disk space alerts haven't been forgotten. But PA WatchDISK goes one step further: Besides just alerting on low disk space, it can alert you on significant changes in disk space usage as well.